Great looking slice. Don't you agree? I guess this recipe falls into the category of "just because you can." There really wasn't a lot of rationale behind it, except perhaps that I wanted pizza. A quick look in the refrigerator and pantry made it evident that something Mexican-inspired was really the way I had to go. But I didn't want enchiladas, or tacos or tortillas. I wanted pizza crust. So my mind turned. Why couldn't you make a pizza that had all the ingredients of, say, tortillas, but on pizza form? The answer is that you can. This gave me my starch fix, apparently required from my craving, as well as used up some ingredients that were hanging around in my fridge. Just because something is usually one way doesn't mean it has to always be that way. Isn't that one of the qualities of a good cook? Always wanting to experiment is a defining feature. That sense of inquisitiveness in us is strong. This crust is a good one if you like thin crust pizza. I didn't think that a big puffy crust was the way to go on a Mexican pizza. At least this way it stayed a little closer to a tortilla. Remember this crust for any recipe that calls for a thin pizza dough. Although not a great leap into the unusual or unknown, this was a great way to use up some odds and ends. It was also pretty tasty. It was nice alternative to tortillas, because let's face it, they can be messy. And who needs more mess? Make the crust first. Proof the yeast in the warm water mixed with the sugar. Once the yeast is creamy (proved active, about 10 min) add the salt and flour. Stir with a spatula to bring it together. Knead briefly, about 1 minute. Let rest, covered, in a warm spot for 20-30 minutes. 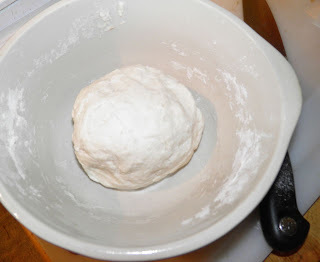 While the dough rests, heat the oven to 425°F. Also during this time sauté the beef, onion, jalapeno and garlic in the oil until the meat is no longer pink and the onions have softened slightly, about 5 minutes. Remove from the heat and mix in the cumin, oregano and paprika. Press the dough out into an 10x18 pan that has been lightly oiled. Top the dough with the salsa and then the beef mixture, spreading both out evenly. Dot the pizza with the cubes of cheese. Scatter the green onions on top. Sprinkle with salt and pepper. 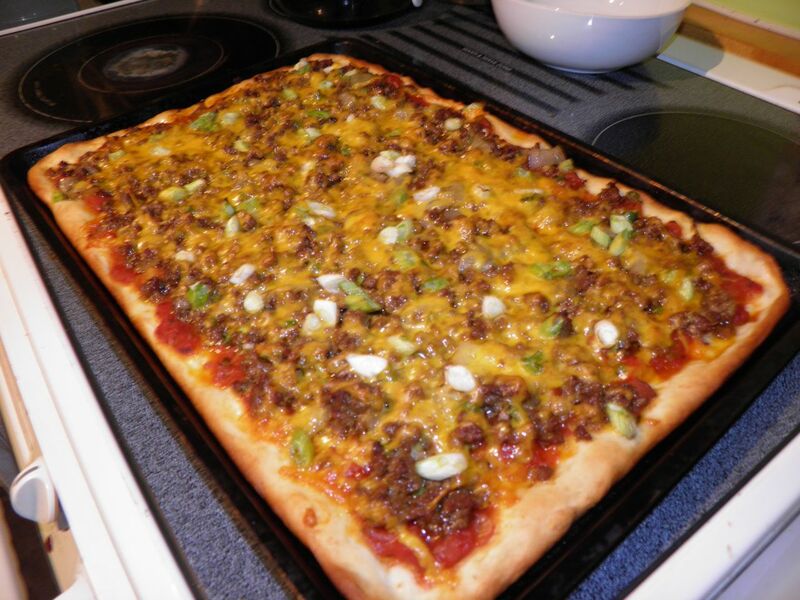 Place the pizza in the hot oven and bake for 20 minutes, or until the crust has browned on the bottom. 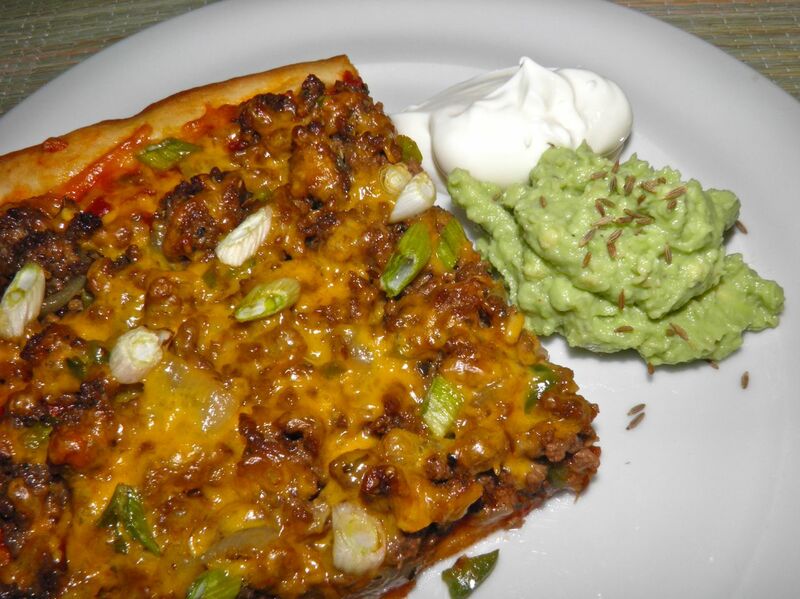 Serve the pizza with sour cream and avocado that has been mashed with lime juice.